Speaker Pelosi must think that we’re totally gullible if she thinks we’ll believe that crap. Pelosi is also trying to get people to believe that Rep. Omar’s statement about allegiance to foreign governments was just a comment about special interest groups. Rep. Omar sent a letter to a judge asking for leniency for men trying to become ISIS terrorists. If Rep. Omar is questioning the allegiance of Americans who also support Israel, it’s only fitting that we can question her allegiance to the US while she supports leniency for ISIS. Ilhan Omar sits on the House Foreign Relations Committee, where she can spread her anti-Semitic policies. What the hell is Pelosi thinking? Is Pelosi intent on alienating Jews from Democrats? Finally, Rep. Omar deserves to be officially criticized by the full House for her racist statements. What’s frightening is that Rep. Omar is a member of the House Foreign Affairs Committee, though there’s no record of that on her website. Rep. Ilhan Omar (D-MN) struggled to defend a tweet accusing Sen. Lindsey Graham (R-SC) of being “compromised” on Thursday, saying the proof was in how he was acting but giving no evidence and eventually saying it was just her opinion. CNN anchor Jim Sciutto, prefacing his question by saying “we need to ask you about this,” read out her tweet and asked her to explain what she meant. Graham has been accused by some progressives of being blackmailed by the White House over being gay; Graham is a lifelong bachelor who is straight. The former fierce critic of President Donald Trump has aligned himself with the White House on some issues, he has also blasted Trump over his foreign policy. It’s difficult for me to believe I’m saying this but it’s possible that Rep. Omar is a step down from Keith Ellison. Whether she’s a step up or down from Ellison, she’s unfit to be in Congress. The caravan of about 4,000 migrants from Central America seeking to enter Mexico and then the United States illegally is attempting to invade and attack the U.S. This assertion will almost certainly be denounced by the usual sources as being hateful or offensive, but it is long past time we stop letting the left prevent us from using words that clearly communicate reality. I hate the Left’s euphemisms. When Antifa riots on the UCal-Berkeley campus, we’re told that they’re protesters. That’s BS. When people get injured by mask-wearing haters, that’s a riot, not a protest. When ricin gets sent to Susan Collins’ home, that’s an attack. That isn’t a passive action. When Black Lives Matter throws concrete blocks at the police from a bridge in Minnesota, that’s a riot, not a protest. The harsh lesson of 1986 was that liberals took the amnesty for 3 million illegal immigrants and then broke their word on controlling the border and creating an effective guest worker program. MS-13, the vicious El Salvadoran gang, killed 17 people on Long Island in New York in a 17-month period in 2016. The gang has an estimated 8,000 to 10,000 members in the United States. Fentanyl and opioids also come across the uncontrolled southern border. Last year, more than 72,000 Americans died from drug overdoses – more than the number of Americans killed during the eight years of the Vietnam War. The construction of Israel’s security fence put an immediate and dramatic end to the Palestinian campaign of suicide bombing. By 2009, only 15 Israelis were killed by Palestinian terrorism, compared with 452 murdered in 2002, the year before construction began. It’s time to build the wall and stop the flow of human traffickers, lethal drugs like Fentanyl and violent gangs like MS-13 into our country. If Democrats attempt to block that project, then it’s time to obliterate them in the next election. Period. At the heart of the Iran deal was a giant fiction that a murderous regime desired only a peaceful nuclear energy program. With this speech, President Trump locked President Obama and John Kerry together in the history books as the people who agreed to and negotiated the worst foreign policy/national security deal in US history. Only desperate or foolish people negotiate a sweetheart deal like this with treacherous people who support terrorists and who want to destabilize the entire Middle East. That’s right. The only man for a job like that is John Kerry, the only person who is more inept at negotiating important national security deals than Hillary Clinton. Over the past few months, we have engaged extensively with our allies and partners around the world, including France, Germany, and the United Kingdom. We have also consulted with our friends from across the Middle East. We are unified in our understanding of the threat and in our conviction that Iran must never acquire a nuclear weapon. After these consultations, it is clear to me that we cannot prevent an Iranian nuclear bomb under the decaying and rotten structure of the current agreement. The Iran deal is defective at its core. If we do nothing, we know exactly what will happen. In just a short period of time, the world’s leading state sponsor of terror will be on the cusp of acquiring the world’s most dangerous weapons. Therefore, I am announcing today that the United States will withdraw from the Iran nuclear deal. There are few issues more important to the security of the United States than the potential spread of nuclear weapons, or the potential for even more destructive war in the Middle East. That’s why the United States negotiated the Joint Comprehensive Plan of Action (JCPOA) in the first place. The reality is clear. The JCPOA is working; that is a view shared by our European allies, independent experts, and the current U.S. Secretary of Defense. The JCPOA is in America’s interest; it has significantly rolled back Iran’s nuclear program. And the JCPOA is a model for what diplomacy can accomplish; its inspections and verification regime is precisely what the United States should be working to put in place with North Korea. Indeed, at a time when we are all rooting for diplomacy with North Korea to succeed, walking away from the JCPOA risks losing a deal that accomplishes, with Iran, the very outcome that we are pursuing with the North Koreans. Let’s be clear about something. This isn’t the case of the United States backing out of one of its treaties. It’s a rare case of a president telling other nations that he isn’t bound to keep the personal promise that a previous president made. Had President Obama tried to get the JCPOA approved as a treaty, it would’ve been rejected on a bipartisan basis. While President Obama is upset that another piece of his legacy just got thrown into history’s dumpster, President Trump won’t care because he knows a terrible deal when he sees it. Trump is intent on demolishing Obama’s legacy and getting the US back on the right track. Based on what he’s accomplished thus far, I’d say that he’s accomplishing his plan. William Saletan is attempting to rewrite history. His latest column attempts to paint over President Obama’s history by saying that President Trump “rewards America’s enemies and punishes its friends.” No president rewarded its enemies more or punished America’s allies more than President Obama. Let’s remember the multiple times that President Obama attempted to punish Israel. Think of how, during the Arab Spring, he threw Egypt under the diplomatic bus. Think of the time early in his administration when he got rid of Winston Churchill’s bust from the Oval Office. That’s how Trump sees the meeting with Kim. It’s not about confronting North Korea. It’s a chance to upstage previous presidents. I don’t see this as being a controversial statement. The history is clear. Clinton, Bush and Obama kicked the can down the road. Now that NoKo is on the verge of getting deliverable nuclear weapons, President Trump has determined that there isn’t any more road left to kick that can down. He’s decided, totally unlike Susan Rice, that North Korea can’t get a nuclear weapon. Not only didn’t Saletan prove his statement correct. It’s that there’s abundant proof that he’s just plain wrong. These days, Democrats are using the term border security as their new euphemism for comprehensive immigration reform. To Democrats, border security means not building the wall or ending chain migration. Democrats insist that the wall is a poison pill, that linking DACA to building the wall is a deal-breaker. I’m upset with Republicans for not fighting that by questioning Democrats why they think that building a border wall is a poison pill. For that matter, I’d love seeing Chairman Goodlatte invite someone from the Israeli Defense Forces, aka the IDF, or Mossad, the Israeli intelligence agency, to testify in front of the House Judiciary Committee on whether their wall has protected Israel from terrorist attacks. The Israelis are the gold standard at keeping their people safe. They’re surrounded by water and terrorists. The terrorists have a virtual unlimited supply of short- and medium-range rockets. They also have the determination to kill Israelis. During the “Second Intifada”, which started in 2000, Israelis built the border wall. From 2000 to 2003, there were 73 terrorist attacks. After the wall was built, from 2003 through 2006, terrorist attacks dropped to 12. Let’s hear Democrats insist that a border wall doesn’t work or that it’s a poison pill after hearing that type of testimony. The Democrats insist that the wall is a poison pill because special interest organizations that fund their campaigns want to keep the stream of illegal aliens flowing. Period. That’s why it’s imperative Republicans hold onto the U.S. House. Everyone knows that there’s enough Senate Republicans who will cave on the wall. We need to keep our majority in the House to shut down any bill that doesn’t include funding for President Trump’s wall. Let’s be exceptionally clear about this. Conservative hardliners should stop debate of any immigration bill that doesn’t end chain migration, doesn’t end the visa lottery and doesn’t fund the building of President Trump’s wall. That’s our poison pill because, without all of those things, the border isn’t secure. No amount of happy talk will make it so. Finally, Republicans should insist that Democrats eliminate any euphemisms that make it sound like they’re serious about securing the border when they aren’t serious about securing the border. If Chuck Schumer wants to throw a hissy fit on the Senate floor after getting called out on this, that’s fine. Let him look like a jackass. After Sen. Schumer finishes his diatribe, the Republicans should then reiterate how the border wall between Israel and the West Bank has kept Israel safe for a decade. While Democrats and Palestinians criticize President Trump’s decision to move the U.S. embassy from Tel Aviv to Jerusalem, other nations are announcing that they’re moving their embassies to Jerusalem. 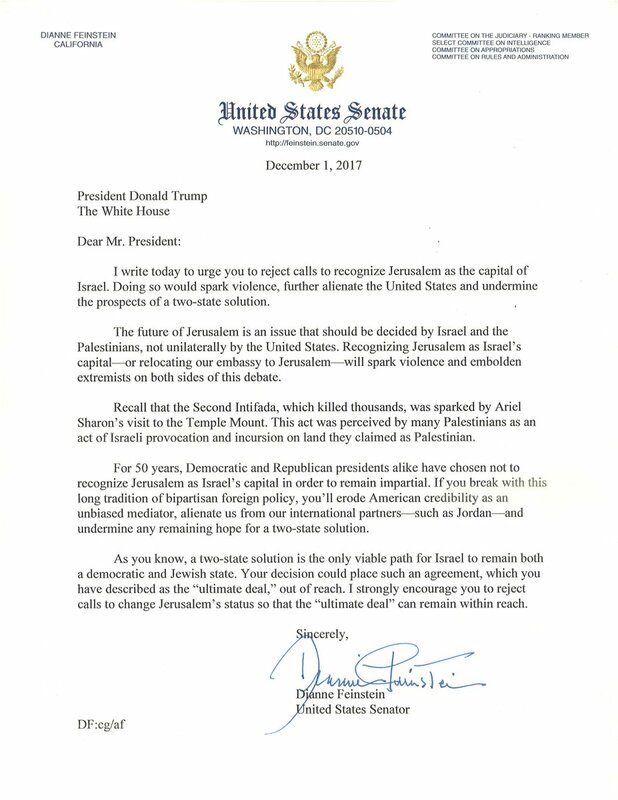 The future of Jerusalem is an issue that should be decided by Israel and the Palestinians, not unilaterally by the United States. While Democrats criticized President Trump’s decision, world leaders sided with President Trump. That’s what leadership does. Leadership molds consensus. It doesn’t conform to consensus. President Obama led from behind. President Trump just leads. Period. 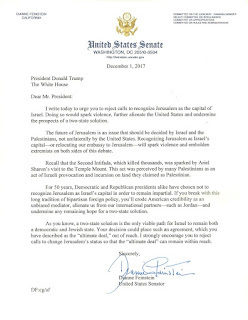 This afternoon, President Trump officially announced “that America formally recognizes Jerusalem as Israel’s capital city.” Predictably, opponents raised concerns that this might derail the (mostly imaginary) peace talks. For more than 20 years, the ‘international community’, another fictional creation, has insisted that recognizing Jerusalem as Israel’s capitol would prevent a peace agreement. That’s another farce. The Palestinian Authority, aka the public version of Hamas, is the biggest impediment to Middle East peace. They’ve had the opportunity to establish a Jewish state multiple times. Each time, they’ve rejected the terms because they wouldn’t admit that Israel has a right to exist. The interview started with Sandra Smith asking Prof. Dershowitz “Do you think there was collusion here”? Prof. Dershowitz immediately replied “I think it’s obvious. First of all, if the United States did not have a role in having this go through, it would show that we had abdicated responsibility. Of course, we had a role.” President Obama and Secretary Kerry played their parts as useful idiots perfectly in letting UNSCR 2334 pass. Prof. Dershowitz has been on fire on this subject since President Obama, Secretary Kerry and Ambassador Power stabbed Israel in the front. Later in that interview, Prof. Dershowitz said “He will go down in history — President Obama — as one of the worst foreign policy presidents ever.” Hillary Clinton started the negotiations with the Iranians, which makes her one of the worst Secretaries of State in US history. Secretary Kerry, though, IMO, is worse because Hillary did this to curry favor with the left. Kerry made this decision because he’s that stupid. Let’s remember that then-Sen. Kerry criticized President Reagan for putting Pershing II missiles into western Europe, saying that this would start an arms race that the US couldn’t win. A short 5 years later, the Soviet Union collapsed. Let’s remember that, as a presidential candidate, then-Sen. Kerry downplayed Qaddafi turning over his WMDs, saying that was inevitable. It became inevitable because Libya was afraid of getting invaded after the US finished off Iraq.